Barely two months from the closure of the scheduled six month closure and rehabilitation of the famous tourist spot is beginning to reward the Duterte administration of its iron-fist policy to help the famous and pristine jewel of the country that is Boracay. Last Saturday June 23, reports whale shark (butanding) have been sighted in the famous island paradise. 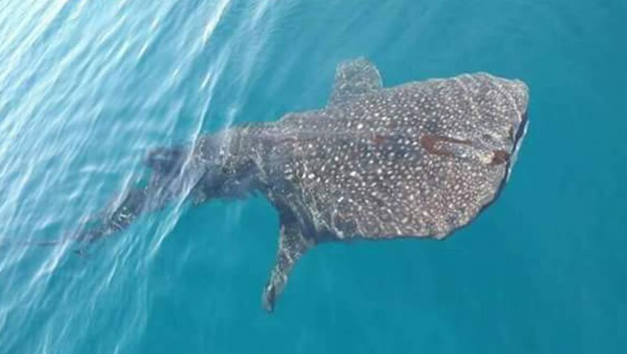 A local tour guide and a local of the area, Joy Ferolino said that although rare whale sharks are not an unusual visitor, their presence have been somewhat limited due to the different watersports activities in the island. The presence of a whale shark (scientific name : rhincodon typus , or more commonly known called butanding) off Boracay Island shows that the decision of the government to rehabilitate the island despite protests from the opposition politicians has succeeded. “That shows that the efforts to cleanup Boracay has succeeded,” Presidential Spokesperson Harry Roque said in a press conference in Cagayan de Oro City. Last May 9 the President Duterte created the inter-agency task force to reverse the degradation of Boracay island. “If you are able to attract a whale shark, that means you must have pristine waters in Boracay. Congratulations to all those involves in the rehabilitation of Boracay,” the Presidential Spokesperson said. Boracay was closed from April 26 to give way for the six month rehabilitation period aimed at bringing back the stature of the island with pristine white sands and crystal clear waters.